A TENS unit is a device that stimulates nerves throughout the body by applying an electrical current through the skin. It can be used to reduce chronic pain, prevent headaches and migraines, and even alleviate the symptoms of depression. Read on to learn more about how it works, how to use it, and the mixed research results behind various uses and TENS techniques. TENS is short for transcutaneous electrical nerve stimulation. It is a safe, inexpensive, and non-invasive method of stimulating nerves by applying electricity to the surface of the skin. Because it can be used to stimulate almost any nerve in the body, TENS has a very diverse range of uses. One of the most common uses of TENS is to reduce chronic pain throughout the body. It can also be used to help with psychological disorders, improve lung function, and even potentially enhance athletic performance. Because it is a relatively new technology, new uses for TENS are constantly being developed and discovered. However, not all studies find that TENS is effective, and results can be quite inconsistent across different studies. One possible reason for this is that TENS treatment may be very susceptible to the placebo effect. Unfortunately, many of the early studies on TENS were not placebo-controlled, which can make it difficult to draw firm conclusions. We encourage healthy skepticism when looking at any particular health claim about TENS. It’s not actually known for certain how TENS might work, although a few prominent theories claim to explain at least some of its effects. The most common explanation of how TENS works for pain relief involves the “gate control” theory of pain. The basic idea is that stimulating large areas of the skin may shut off or suppress the nervous system in the upper part of the spinal cord. Closing this “gate” may prevent pain signals from passing to the brain from the rest of your body [R]. Reduced pain may cause the body to release natural (“endogenous”) opioids or the body’s “natural painkillers” — according to another explanation [R]. Repeated use of a TENS unit may also lead to gradual changes in the nearby muscles which allows them to relax more easily, which could lead to decreased sensations of pain in those muscles [R]. Although the way that TENS is used can be very flexible and is often tailored to the individual users’ needs, there are a few popular variations referred to by specific names. The most common is Acu-TENS, which means that the TENS stimulation pads are placed on specific acupuncture points [R]. There is also a technique called “tVNS”, which stands for transcutaneous vagus nerve stimulation. This is a method of connecting a TENS unit to specific parts of the ear in order to stimulate the vagus nerve and is most commonly used to treat mental or psychological conditions (such as depression) [R, R]. There are also some other devices that are similar to TENS. For example, an interferential currents (IFC) unit works similarly, although its electrical stimulation is stronger and can penetrate deeper into muscles. One study found that both TENS and IFC units are effective and do not differ much in their ability to relieve lower back pain. Not many studies have directly compared the effectiveness between the two [R]. Another technique, called electroacupuncture (EA), uses small acupuncture needles to deliver electrical stimulation instead of pads. One study found that EA was more effective than TENS for relieving lower back pain, although this may be because its stimulation is more direct and invasive. EA quite impractical for home use, though, as it requires a trained professional to apply [R]. In one study (RCT) the TENS unit reduced shoulder pain and improved shoulder joint mobility of 90 participants with shoulder pain from paralysis on one side of the body (hemiplegia). TENS also improved their overall quality of life [R]. The TENS unit may also help people suffering from chronic pain. In an observational study of 33 people with chronic back pain, 14 (42%) of them experienced at least a 30% pain reduction from TENS. And out of the 14, 13 felt the benefits within an hour or less of using the TENS unit [R]. A study (DB-PCT) of 60 patients with upper back pain found that using a TENS unit reduced pain much better than placebo [R]. In another study of patients with back pain, those who used TENS ended up making significantly fewer hospital and clinic visits [R]. A study (RCT) in arthritis patients found that using a TENS unit helped reduce pain during walking and at rest [R]. The TENS unit may also help with pain related to dental procedures. Using the TENS unit in preparation for cavity-filling treatments suppressed pain during the procedure in 80% of patients in one study [R]. A study (RCT) with 54 patients that underwent spinal surgery found that TENS had a pain-reducing effect (analgesia). It reduced the number of needed painkillers and their side effects [R]. Patients who used a TENS machine after surgery required less pain-relieving medication in another large study (PCT) of 1,350 people [R]. Those who used a TENS unit after surgery had lower levels of pain than those in the control group in a study (RCT) of 40 patients who underwent surgery that required a large chest incision (a procedure called posterolateral thoracotomy, often used for lung or heart surgery) [R]. In a study (RCT) with 40 patients who underwent open-heart surgery, using the TENS unit at acupuncture points (“Acu-TENS”) helped to return blood pressure and heart rate to normal more quickly and using fewer medications (compared to patients who did not use TENS) [R]. Both high- and low-intensity TENS treatment helped relieve pain following a major surgery in another study (RCT) of 64 patients [R]. Patients who used TENS after surgery had an improved breathing, less pain, and required less pain-killing drugs than patients who did not use TENS in a study (PCT) with 50 patients who underwent chest surgery. A related study concluded that using a TENS unit alongside painkillers relieves pain much better than just the medication [R, R]. However, not all studies have found a beneficial effect on pain after surgery. For example, in one study (PCT) with 45 patients who received surgery (pulmonary artery bypass), using TENS did not significantly reduce pain. While the reason for this lack of effect is not known, this study may illustrate how small, subtle differences in TENS procedures might make a big difference in terms of its effectiveness and health benefits [R]. A study (RCT) with 110 patients found that applying TENS at the base of the head (occipital nerve) significantly decreased the duration of headaches in migraine sufferers. It also had low rates of side effects, making it attractive to patients that did not want to take medications for their migraines [R]. Similarly, a study in 57 patients found that using a TENS unit reduced both the number and intensity of pain episodes in a headache and migraine sufferers [R]. Another study (RCT) found that the use of TENS for headaches decreased medication use and helped patients manage their chronic migraine symptoms better [R]. Finally, another study in migraine patients reported that TENS treatment reduced the total amount of days with a headache. 66% of the patients in this study decided to continue using a TENS unit to keep their headaches at bay, although the patients who followed the TENS directions the best reported the greatest benefits at a follow-up [R]. A technique called Transcutaneous Vagus Nerve Stimulation — or “tVNS” for short — is a method of using TENS to stimulate the vagus nerve (which is done by hooking the TENS unit up to specific parts of the ear). This TENS technique has shown some very promising data on helping with psychological disorders such as depression. A large number of studies have found that tVNS can help fight the symptoms of depression — for example, by stimulating the regions of the brain associated with reward processing and motivation — and leads to significant and measurable improvements in depression patients’ overall level of symptoms [R, R, R, R, R, R, R]. Strokes often cause extensive damage throughout the brain, which can cause a lot of long-term after-effects that can be very difficult to recover from. Many stroke patients end up having difficulties moving and walking, although some evidence shows that TENS treatment may help stroke victims recover from these impairments. A study (PCT) in 14 chronic stroke patients found that pairing TENS treatment with exercise improved their balance and enhanced their ability to walk and that these improvements were significantly greater than those from just exercise alone [R]. Similar results were found in another study (RCT) with 34 stroke patients. Pairing TENS with exercise training over 6 weeks led to improved balance, walking ability (gait), and reduced muscle stiffness and spasms [R]. TENS also increased the effectiveness of exercise in stroke sufferers by increasing their walking speed and walking distance in a study (R-PCT) of 109 patients [R]. Another study (PCT) with 14 stroke patients reported that TENS treatment helped improve their ability to walk and control the lower halves of their body [R]. In one of the relatively few studies to use a realistic “placebo” condition (RCT), 13 healthy young men were given either real or fake (“sham”) TENS treatment. The real TENS improved resting heart rates and led to better regulation of blood pressure. During fake TENS, the participants are hooked up to a real TENS machine but receive no actual electrical current — particularly important for teasing apart the actual TENS effects [R]. However, the cardiovascular benefits of TENS might not apply to everyone, but only to people who are already healthy. For example, in a study (PCT) of 45 patients, using a TENS unit after heart surgery (pulmonary artery bypass) did not reduce their future risk of heart problems [R]. Some older studies reported that TENS helped reduce high blood pressure. However, a more recent study (RCT) with 32 hypertensive patients found no evidence that the TENS unit decreases blood pressure [R]. A study (DB-RCT) with 40 women who had very painful menstrual cramps (dysmenorrhea) found that TENS was effective at reducing cramp-related pain, and led to significant improvements in these patients’ quality of life. The patients used a portable TENS units, which was particularly helpful in maintaining their treatment effectively [R]. In another study (PCT) with 134 women with painful menstrual cramps, TENS reduced both the intensity and duration of pain more than a placebo treatment [R]. TENS was also useful for quickly relieving menstrual pain in a study (DB-RCT) with 40 women. Three months after the study, 70% of the women were still using the TENS unit regularly with no adverse side effects [R]. The TENS unit may relieve pain associated with giving birth. A study (PCT) found that women who used a TENS unit during their stay at the hospital experienced significantly less labor pain, suggesting that TENS may be helpful both during and after labor [R]. Although the evidence is somewhat mixed, some studies suggest that the muscle-relaxing effects of TENS may be helpful for increasing athletic performance. A study (RCT) found that using a TENS unit while stretching increases athletes’ range of motion and reduces muscle pain [R]. Another study also found that TENS increased the amount of time that athletes could exercise (increased endurance) as well as decreased pain during exercise [R]. However, another study (SB-RCT) with 13 participants who used TENS to treat their cycling-related pain found that TENS did not significantly change the amount of pain that they felt, and did not affect the amount of time it took to complete a 5km bike ride [R]. People with Parkinson’s disease often have uncontrollable shaking (motor tremors). Two studies have found that using TENS on the hands and arms of Parkinson’s patients can help suppress their uncontrollable shaking by an average of 62% [R, R]. Another common symptom of Parkinson’s is difficulty walking (“freezing of gait”). A study found that applying TENS to the feet and legs of Parkinson’s patients improved the ability to walk in 12% of the patients tested, and increased the amount of time that these patients could walk by an average of about 20% [R]. In one study, 42 patients with overactive bladder syndrome (OBS) got a TENS unit and also kept a “bladder diary” for 48 hours to keep track of their symptoms. TENS was safe and effective for OBS, with 50% of the patients reporting that they were “satisfied” or “very satisfied” with the treatment. The TENS unit also completely cured uncontrolled urination (urinary incontinence) in 39% of the patients. None of the patients reported any side effects [R]. In another study (DB-RCT) on 47 children around age with bed-wetting problems, applying the TENS unit for one hour twice daily for 10 weeks did not reduce the number of bed-wetting episodes. However, another study found that 72% of the patients had a reduction of at least 1 bed-wetting night per week, which was maintained even after the study [R, R]. A study (RCT) with 28 fibromyalgia patients found that TENS treatment reduced pain, anxiety, fatigue, and muscle stiffness, which in turn greatly improved these patients’ ability to work [R]. These benefits were confirmed by another study (PCT) with 39 fibromyalgia patients — TENS treatment decreased pain and fatigue. Using two TENS units together can increase these benefits even further [R, R]. However, a review (of 8 fibromyalgia studies) came to the conclusion that there is not yet sufficient evidence to say for sure that TENS consistently works to relieve pain in fibromyalgia patients [R]. In a study (SB-PCT) with 50 patients with chronic obstructive pulmonary disease (COPD), TENS treatment increased the amount of air the lungs can hold (lung capacity) and improved the overall symptoms [R]. In another study (DB-PCT) in 21 COPD patients, the TENS improved breathing during exercise, although it did not increase in the amount of time they could walk [R]. Other studies have consistently reported similar benefits — improved breathing in COPD patients during physical exertion — with both TENS and “Acu-TENS” (a technique of using TENS stimulation at acupuncture points on the body) [R, R, R]. In a study with 4o women, those who used the TENS unit had an increase in their voice quality and intensity, which made them feel more comfortable while speaking. A review of many studies (RCT) confirmed that the TENS unit can improve voice quality [R, R]. The TENS unit also improved the symptoms of behavioral dysphonia, a type of speech impairment without an unknown cause. In a study (RCT) in 30 women, TENS improved their voices and reduced speech impairment [R]. When a person loses one of their limbs, they will sometimes continue to experience feelings in the parts of their body that are no longer there — a condition known as a “phantom limb”. Researchers began to search for ways to re-create the sensation of lost body parts. They applied TENS to the amputated body to develop advanced robotic replacements (prosthetic limbs) that could feel real. Although still in the early stages, this could be a huge leap forward in the technology of robotic prosthetics and body-machine interfaces [R]. The way in which TENS units are used can make it difficult to draw solid conclusions from many studies. Most of the time, TENS is administered not by a medical professional, but by the patients themselves in their own home — therefore, the way they use their TENS unit may be inconsistent, and it can be difficult to verify whether all the patients in a given study followed the procedures correctly or in the same way. Some research has shown that few patients follow the recommendations perfectly, and therefore may not achieve the maximum desired results. This means that caution should be used when trying to draw conclusions from any single TENS study, as the results may not be entirely reliable [R, R, R]. Another problem is that one of the most common uses of TENS is to treat pain — but pain can be highly subjective and difficult to measure precisely (quantitatively). Relatedly, it is also very difficult to know how much of TENS’ effects might be due to the placebo effect. Many of the early studies done on the TENS unit did not use a placebo group, and at least one large placebo-controlled study has reported no significant differences between the effects of TENS treatment and the effects of a placebo. 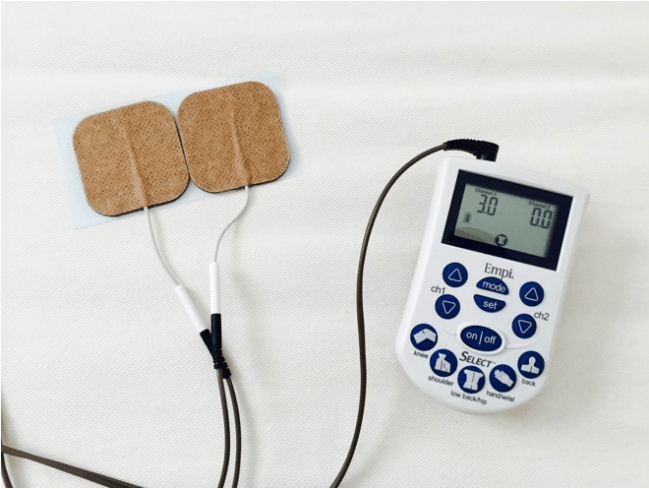 Similarly, a large-scale review of many different TENS studies came to the conclusion that they could not confirm for certain that the TENS unit was any more effective than a placebo for treating osteoarthritis pain. In light of these issues, any study that is not placebo-controlled should be looked at with some skepticism until further research confirms their results [R, R, R]. Although there are many different types of TENS units, most of them share the same basic features. Next, you should prepare your skin for the TENS unit by cleaning the area with soap and water, or a small amount of rubbing alcohol. After your skin has completely dried off, take the stimulation pads from the unit and place them around the area you want to stimulate (for example, wherever your pain is). Slowly turn up and adjust the dials to find the stimulation pattern that you find works the best. Note that if it is applied properly, the TENS treatment itself should not be painful. 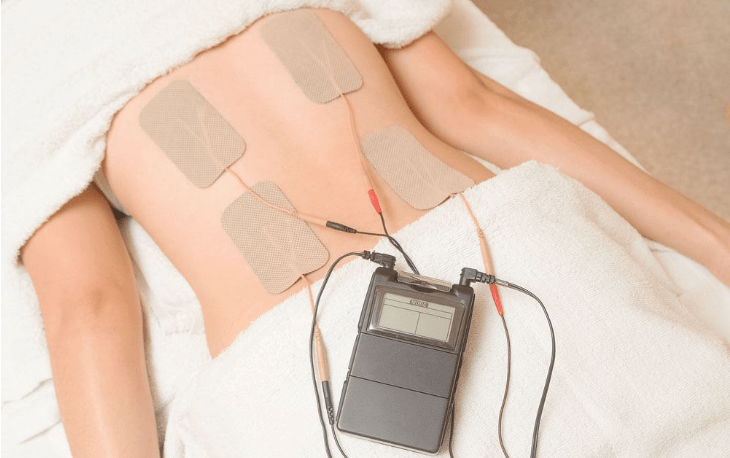 There are many different strategies for how and where to place the electrodes on your body. The effectiveness of the TENS may depend on the placement of the pads, so TENS users should experiment to find out what works best for their particular symptoms. However, one solid rule is to make sure that the pads are not touching each other — at least 1 inch apart is the generally-accepted minimum amount of space between them [R]. The effects of TENS treatment seems to be dose-dependent, meaning that the benefits you receive can depend on the frequency and intensity that is used. However, the optimal stimulation levels might be different depending on the specific condition you are using TENS to treat. For example, a review of 43 TENS studies found that “moderate” levels of TENS (medium frequency and strength of electrical stimulation) was effective for treating muscle pain, but that other types of pain may benefit from more intense stimulation levels [R]. Because each condition is different, it is not possible to recommend any particular set of TENS unit settings. However, researchers have noted TENS is much more likely to have positive results when patients carefully follow the instructions that their medical experts give them [R]. The vast majority of participants in the many TENS studies that have been done report no adverse side-effects. One of the only reported negative effects is minor skin irritation at the placement of the electrodes, as well as possible pain when removing the electrode pads [R]. Because it involves running (low levels of) electricity through the body, there is a small chance that the TENS unit could interfere with an implanted device, such as a pacemaker. Although the studies on this are unclear, it would be wise to use caution when using TENS if you have a pacemaker [R]. There are many different TENS units you can purchase, and they are sometimes even covered by some insurance programs. TENS units also vary considerably in size and strength — therefore, keep in mind that these user experiences may be specific to the particular TENS unit and setting that each person used. Most people also say that their TENS unit is easy to set up and learn how to do yourself, as most of the machines are designed to be as straightforward as possible. Some users report a reduction in back pain, which seems to be one of the most common home uses of this product. Other users have said that using it has helped them to manage their pain after surgery. There are other reports of users saying it was incredible for keeping their headaches at bay. Some of the main complaints include that the pads of some machines are either too sticky or not sticky enough, which can make them somewhat difficult to set up properly. Additionally, as with any electronic product, there are always reports of units breaking or not working properly after some time – so it may pay off, in the long run, to invest in a relatively higher-quality unit if you plan on using it regularly for an extended period of time. Finally, many users have noted that the feeling of the electricity on your skin can be strange at first, and can take a while to get used to. A few users have even said that they were never quite able to get used to the strange feeling of it, and therefore did not decide to keep using their TENS unit. I’m sure that the “Tens” therapy has come a long way since I was first introduced to this therapy? Are there any studies that indicate this treatment may by applicable for this current finding of my MDs? Thank you for your time and I DO look forward to your response. Hi Gary, Unfortunately, due to the high volume of questions we receive, we are not able to advise or respond to individual questions in the comments. If you’d like, you can join the VIP membership program, where you can ask your questions directly to Joe. Hope that helps!